The Randy Plath family (Randy and Lori (Torrance) Plath of Burlington, IA; Lucas and Kimberly (Plath) Glasgow of Owatonna, MN; and Kristin Plath and Jordan Goldesberry of Springfield, IL) took "The Quill" along on a winter holiday week's vacation January 5-12, 2013 to Negril, Jamaica. 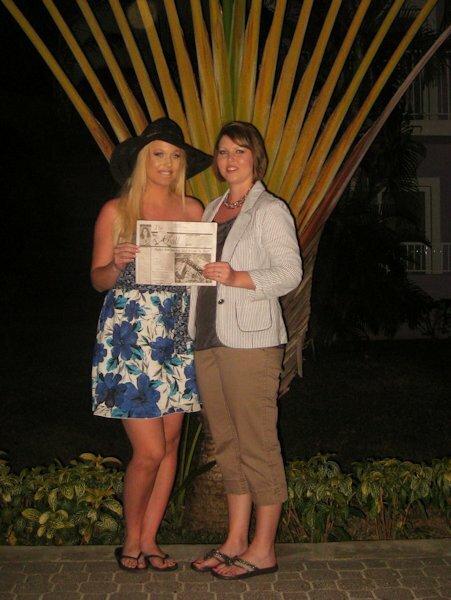 The vacation was planned in celebration of Kim and Kristin's educational accomplishments, as they both graduated in December. Kim graduated from Saint Louis University with a Master's of Science in Nursing and will be working at the Mayo Clinic Health System in Owatonna as a Family Nurse Practitioner. Kristin graduated from University of Illinois in Springfield with a Bachelor's of Science in Biology. Kristin will be continuing her education at St. John's School of Clinical Laboratory Science in Springfield in July.